Some friends were talking about beirocks and runzas. (This is the link if you want regular ones instead of gluten free.) I haven't made them in quite awhile. I was hestitant to attempt to make anything with a gluten free dough. But here they are. They weren't amazing, but good. I'm not sure if it was the added flavor gluten-free flours sometimes add, but I felt like these should be served with a dipping sauce or something. Michael ate his with mustard. I dipped mine in ranch dressing. Next time I'll play with adding a sauce inside and see what happens. In the meantime, these are possible to make gluten free. Mix bread dough according to package directions for bagels. 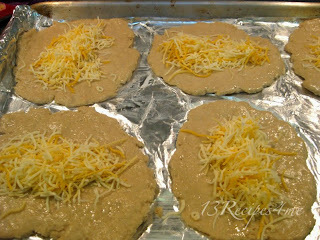 Divide dough into 8-10 pieces. Grease a baking sheet. I rub vegetable oil on my hands before working with the dough to keep it from sticking. 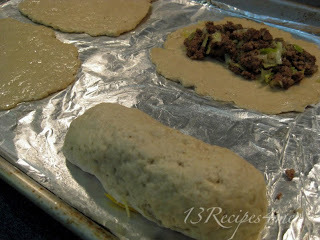 Roll into balls and then use a rolling pin to roll them into circles or rectangels. I let my dough set for an hour after rolling it out, but I doubt it was necessary. It didn't seem to change much. Next time I will just let them set while I prepare the filling, then fill right away. Brown ground beef & onion. Drain. Add cabbage and 1/2 c. water. Season with salt/pepper. Cook until water is gone. 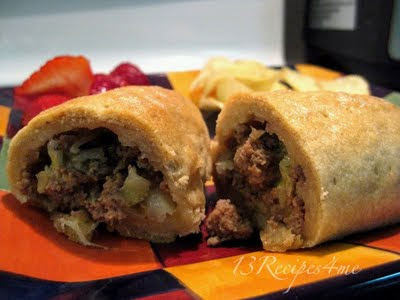 Top each with meat mix, then some cheese. Actually I found that it worked better to lay the cheese on first. That way when you fold the ends together, pinch, then lay them seam side down on the baking sheet, the cheese won't tend to melt out of any cracks at the bottom. Bake 25-35 minutes at 350 degrees or until lightly browned.